Just a few things of humble import, on New Year’s Eve. The last day of 2013. My heart is full as I thank God for the year that has passed, and look forward to the year that is to come. 2014! Wow. 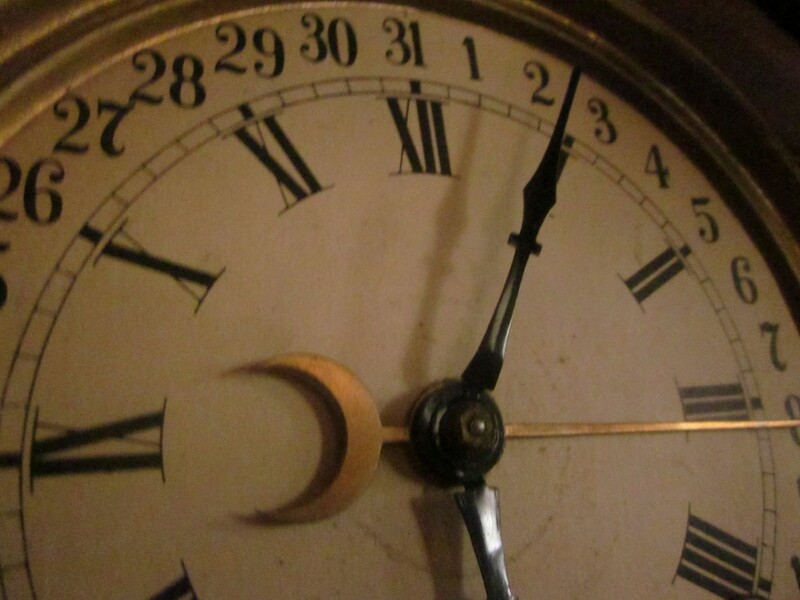 Time just rushes on, doesn’t it? That is my prayer for the coming year. That no matter what happens in my life in 2014, that I will remember that the God of Israel will be with me. It’s quite a comfort. My heart is full. My life is full. I’ve been an emotional mess lately, with some hard things happening around me, involving dear friends and family members. I can burst into tears, these days, Gentle Reader, at the mere drop of a hat. Me: “Waaaaaah! Would everybody just cut out all the hat-dropping?” Snif. So if you see me buying waterproof mascara at Wal-Mart sometime soon, you’ll know why. I’ll be the one with the blotchy face and the big dark glasses. And the cart full of Kleenix boxes. First, we’ve had lots of fun with our granddaughter Anya spending more time out at our place with us. 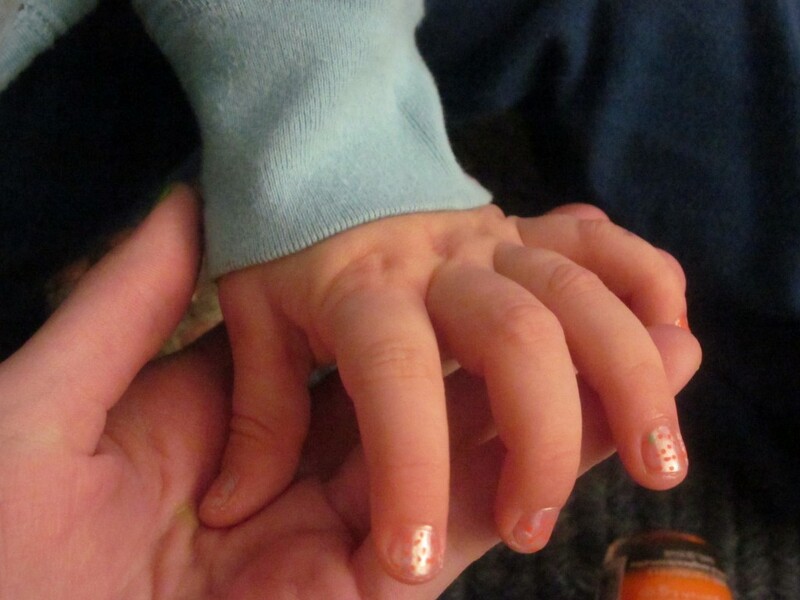 She’s a little doll who loves to have her nails done. When her Papa drops her off for a playdate at Amma’s house, the first thing we do is to get a snack. 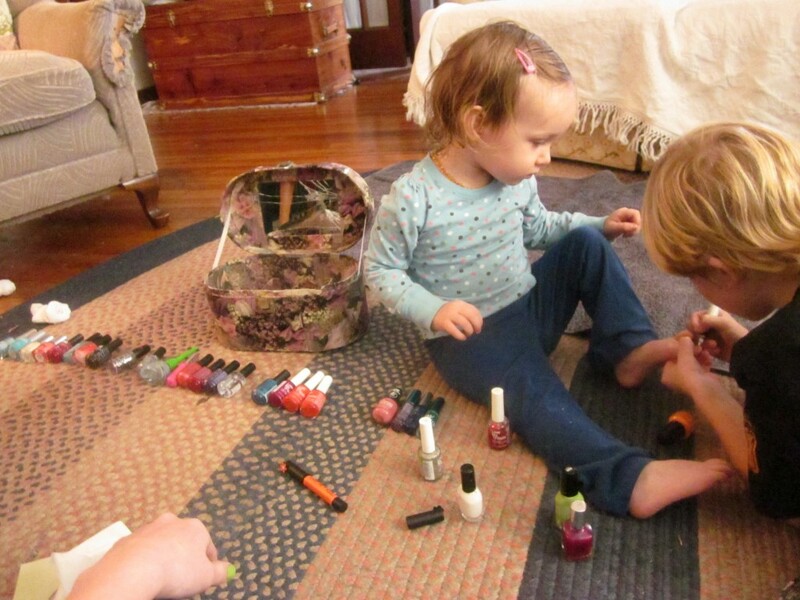 The second thing we do is to paint her toenails and fingernails. It takes a lot of time to do a good job at it, but we don’t mind a bit. She rewards us with the sweetest smiles you’ve ever seen. Doesn’t this picture just make you cry? Snif. 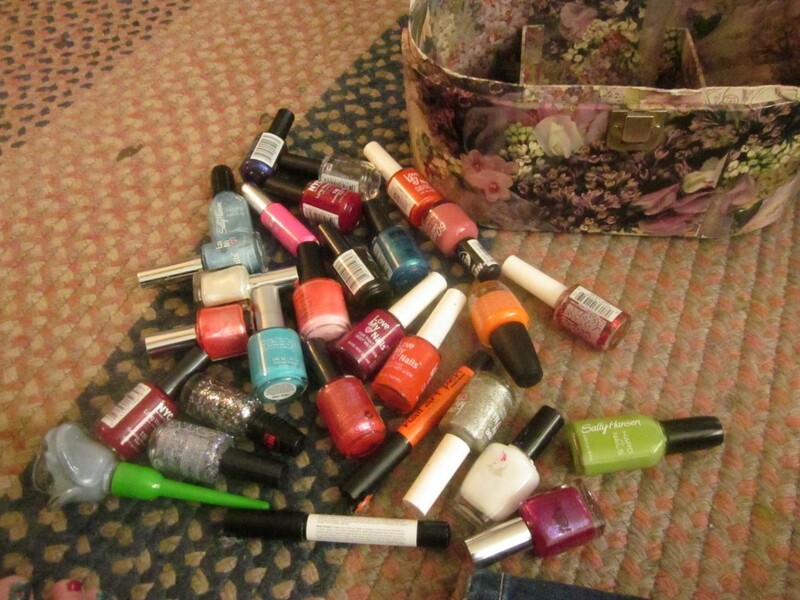 Little Mack lines up all the colors, so it’s easier for her to choose which colors she likes best today. So many colors! Some days it’s very hard to choose. Happy smiles all around! 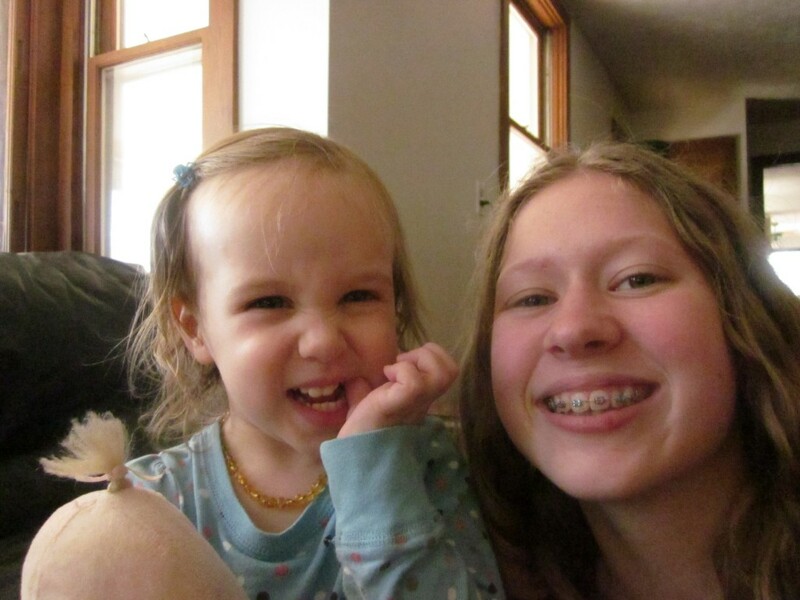 Anya and her Aunt Amalia. Note that Anya is wearing polska-bots on her top, too. Secondly . . . Little Mack has decided that he wants to be a hunter. He thinks he’ll start with rabbits. I told him that if he managed to bag a rabbit, that I would make him a pot of rabbit stew. Honestly I have no idea how to clean a rabbit, but I would figure it out for him. I suppose I could find instructions on Google. And a recipe, at that. He spent a good share of two afternoons out in our windbreak, just sitting and watching for a rabbit. 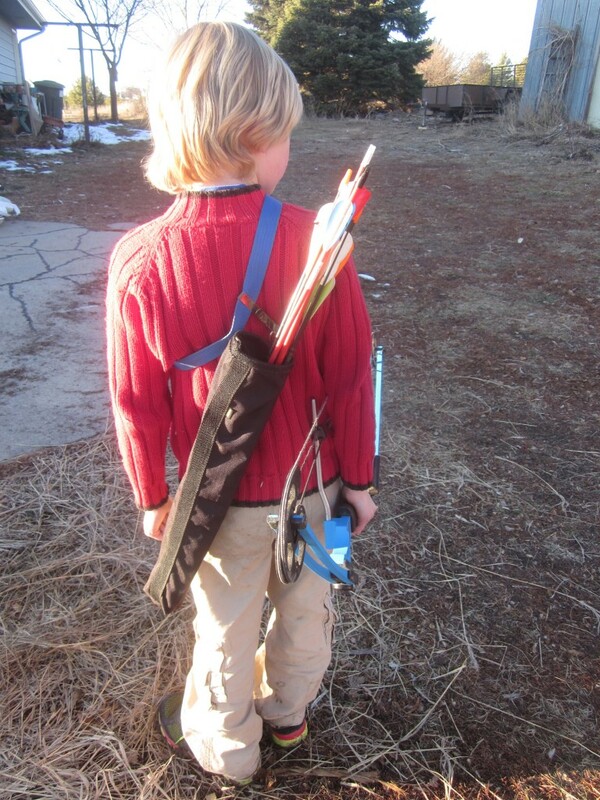 I’m still waiting to see if he’ll be able to shoot a rabbit with an arrow. I honestly don’t think so. Rabbits are so furry and big-eyed and fluffy-tailed. They’re just too cute to shoot, I’m thinkin’. Now if there was a homelier animal that’s edible . . . a warthog comes to mind . . . I don’t think he’d had trouble shooting one of them. Especially if the said warthog, say, was threatening somebody dear to him. Like Anya. Or his old dog, Ollie. Of course we don’t have warthogs in Nebraska, that I know of, anyway. Perhaps Bea has chased them all away. Third . . . Drama is in full swing, although we’re on a holiday break for another week. We do two rehearsals a week, on Monday and Friday nights, and we work the kids very hard, but we have lots of laughs, too. Lots of laughs: it’s melodrama! We work with absolutely the best group of kids on the planet, I believe. I just love them to pieces, and not just because they bring me chocolate nearly every week. Although that does help make them very endearing to me. Not that they need help. Our college girl, Bethany, has generously agreed to teach the cast the two dance scenes in the play: she’s a dancer with years and years (and years!) of dance classes to draw from. And she’s a wonderful teacher. She’s so sweet, as my dad likes to say, that you practically need an insulin injection when you’re around her. Here she is teaching our girls a ballet dance. 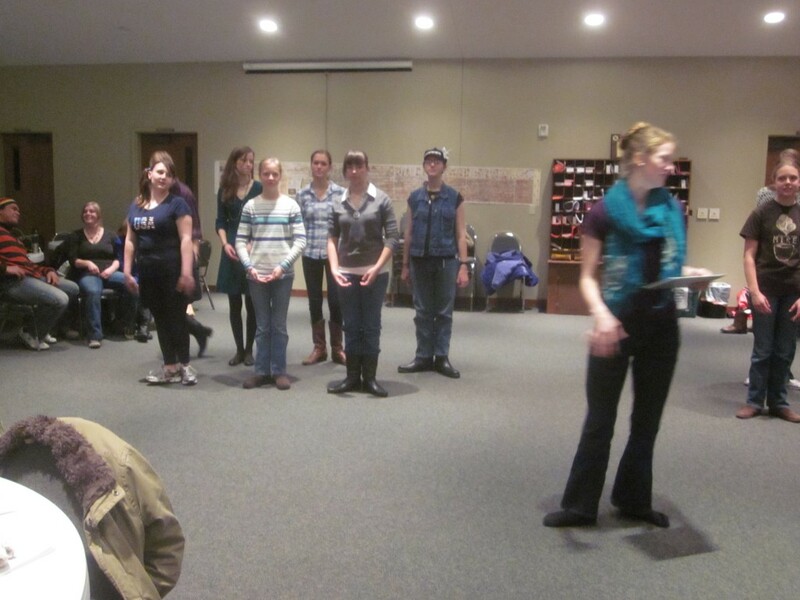 And here she is teaching the cast how to do a basic Waltz step. I love this! 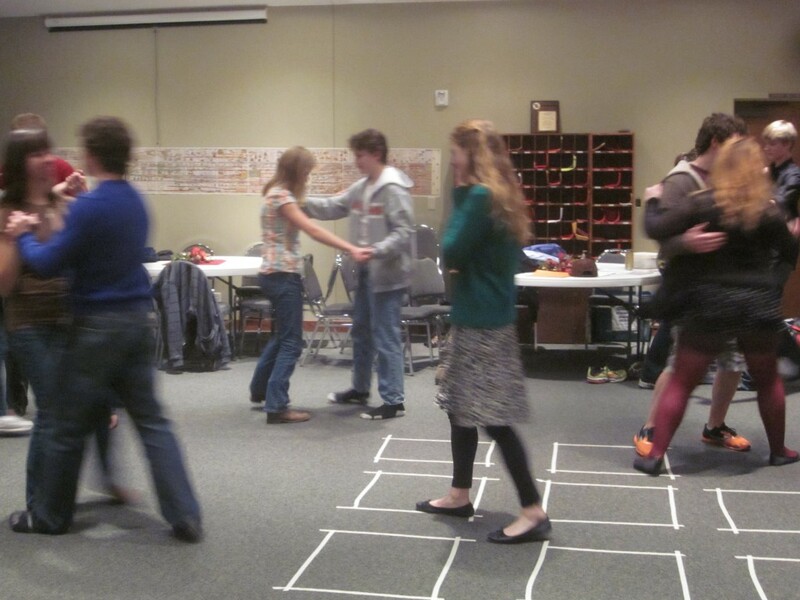 It’s enormously fun, sitting and watching my darling girl teach these students how to waltz. Fourth: a Big Event! 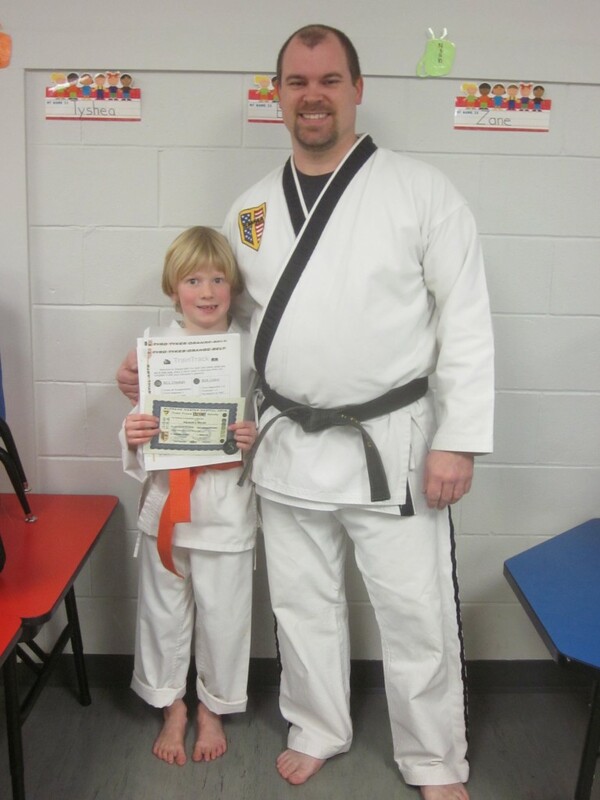 Little Mack just recently was awarded a new level of his orange belt in a solemn ceremony with his Taekwondo teacher and other students. Here’s his instructor, Tom Fosler, of Supreme Master Martial Arts. I’m so thankful for Tom and his positive influence on little Mack’s life. 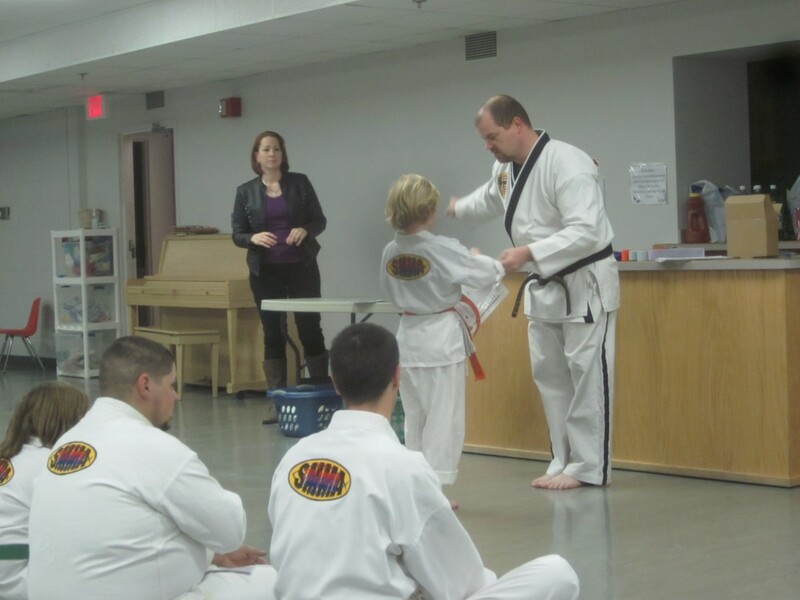 Tom did some sparring with some of the older students, after the awards ceremony. After watching his powerful kicks and blows, I’ll tell you this: I wouldn’t want to get on Tom’s bad side. Tom can really kick and hit and he can also break boards with the side of his hand. He looks all smiley and he seems good-natured and all that, but apparently he could do some real damage, if the situation was dire. Yup. Not going to find myself in a dark alley with Tom anytime soon, say, trying to take his wallet or something. Just an observation. I’m not crying, either, you’ll notice. Mack can’t wait until he can break boards with his hand. 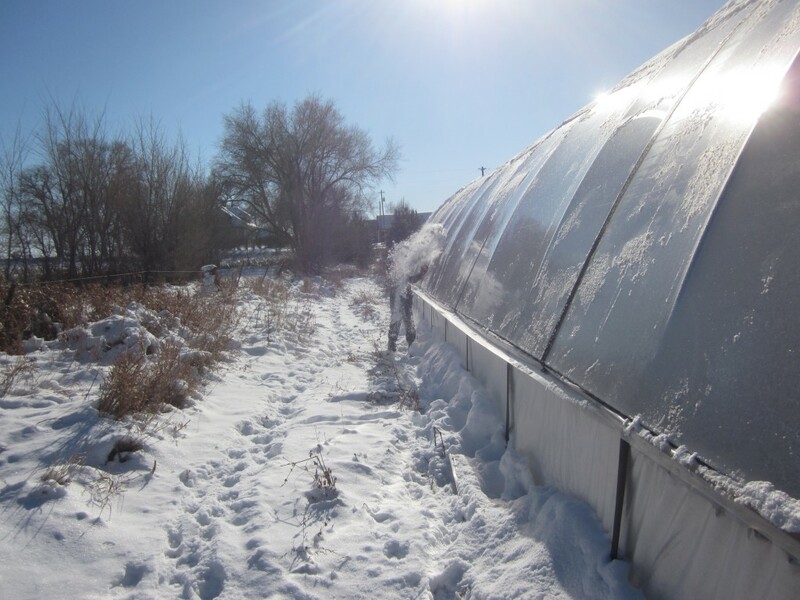 Fifth: Have you wondered about our hoophouse and if there’s anything growing in there, now that it’s wintertime and the temps are regularly plunging down to 0° and even lower? Here’s little Mack (behind the cascade of snow, can you see him?) helping me get the snow off the top of our hoop house. So far it has withstood a couple of storms, though we’ve not had a blizzard or a heavy snow event yet. Knock on wood! I’m still digging up leeks, carrots, and parsnips in there. They are all delicious and sweet, and also a bit hard to find. The green tops have been frozen, but the roots are just being kept nicely cold underground. When we first built this structure, I couldn’t imagine ever wanting more hoop house space–it’s so big! !–but now I must admit that I’m dreaming about having a space this big, just full of root crops, for the winter’s eating. Please don’t tell Bryan about this yet. For now just a couple of beds in the hoop house, dedicated to roots, is pretty spectacular! 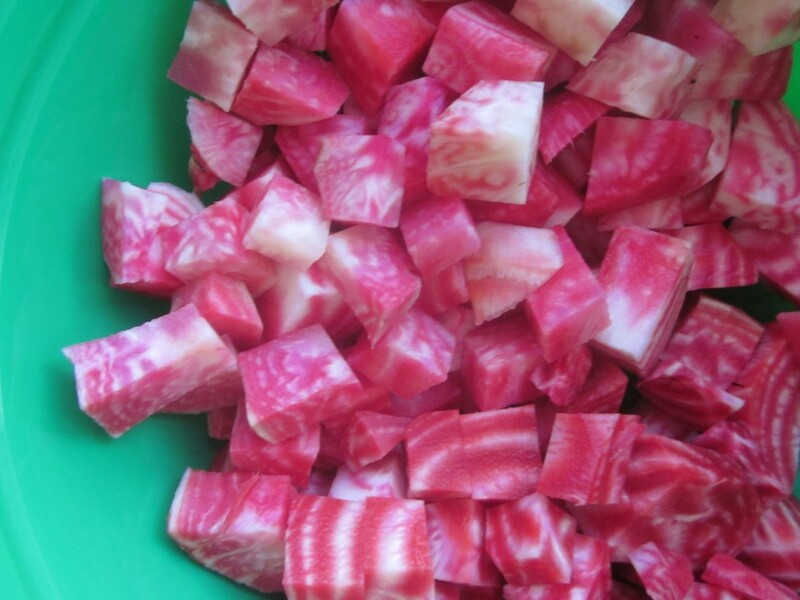 Diced Chioggia beets! Delicious and absolutely stunning, to boot! I have a bin of these in Bryan’s shop, where they stay nicely cool, stored in peat moss. They won’t freeze in there. Just picture it, though, Gentle Reader: an entire hoop house, with beds full of beets, parsnips, turnips, rutabagas, leeks, carrots, winter radishes . . . all waiting in that convenient cold storage for your hearty winter meals. You would time your digging (and eating!) so that by springtime the hoophouse would be all harvested, and then you’d plant your spring crops. What do you think? Of course it’s a brilliant idea, isn’t it?! Actually, I think “low tunnels” would work for this, too, and would be much less work and expense to construct. I might have to just plan on this . 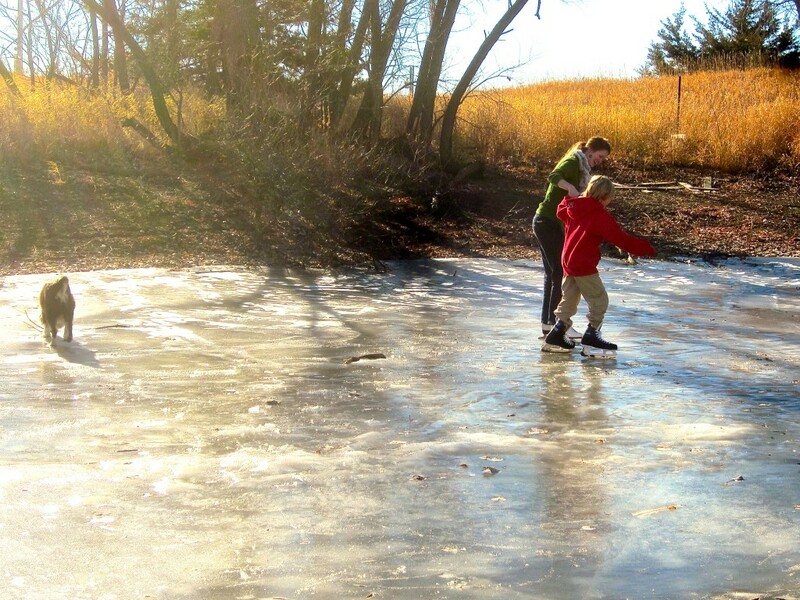 . .
Sixth: We’ve had stretches of very very cold days, followed by a couple of warmish days (in the 40s and even 50s) which makes for perfect ice-skating weather. 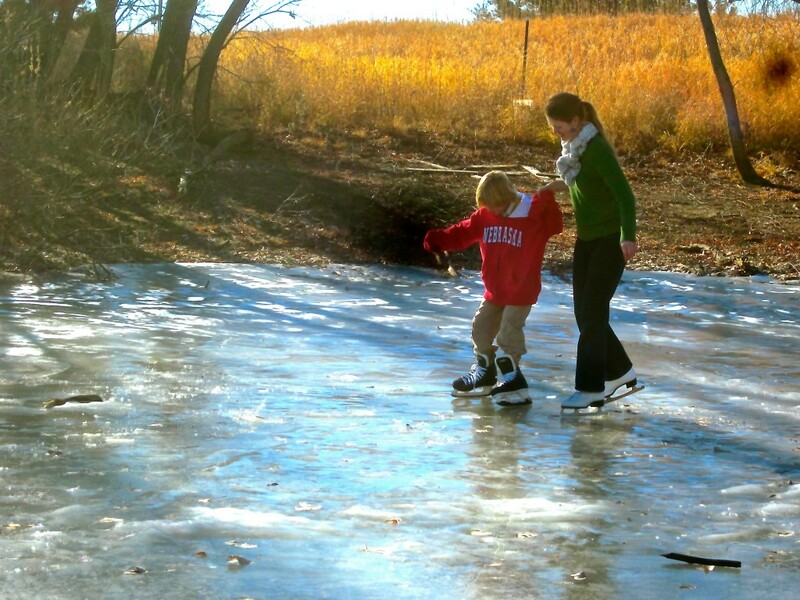 Solid hard ice on the pond + air warm enough to be able to be outside = ice skating weather! 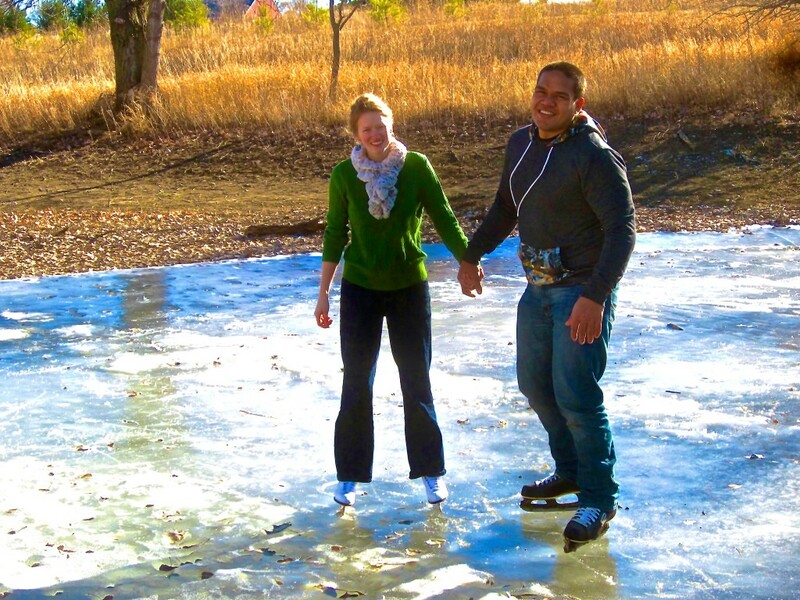 Bethany spent time on the pond with little Mack and her boyfriend Saia (and Bea) one day and I got a few pictures. Bethany skates like a dancer, all fluidity and grace. Little Mack and Saia skate like hockey players, with short choppy strokes and lots of noise and occasional running into each other, falling down, and colliding with the dog. Well. Saia was smoother than that. 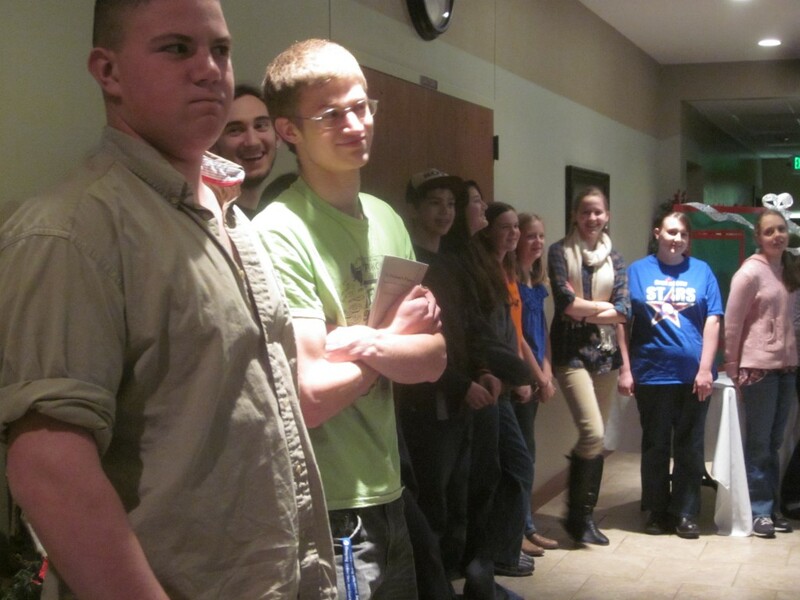 Especially when he was holding Bethie’s hand. Well, Gentle Reader, that’s all I have for now. Six things that are going on around here. I hope that you are having a good and pleasant end of the year at your place, and I’ll see you on the flip side . . . in 2014! P.S. And speaking of The Prairie Homestead (or not!) . . . every Monday, Jill sets up a fun event that you may want to check out, or even (if you’re a blogger, too) participate in! 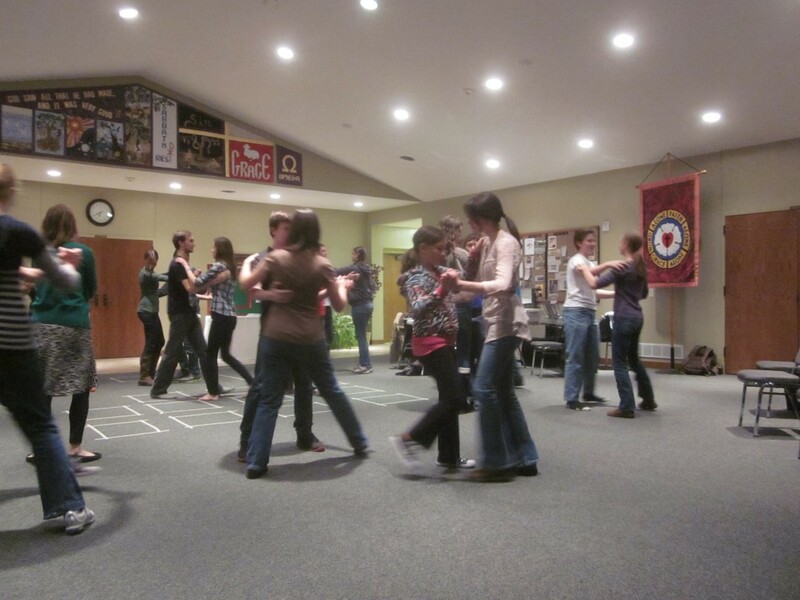 It’s a linking party of sorts, a big countrified barn dance of homesteading-related posts! I’m linking this post up this week right here, and I encourage you to jump on over and check out the other posts there! I love that verse in Isaiah! I don’t think I could get through the next year without it. I know without God, I couldn’t get through today, let alone a whole year. What do people do if they don’t have God before them and behind them? I am just glad that I do! I love your hoop house. That is a dream of mine and I am trying to finagle how to get it and where to put it. 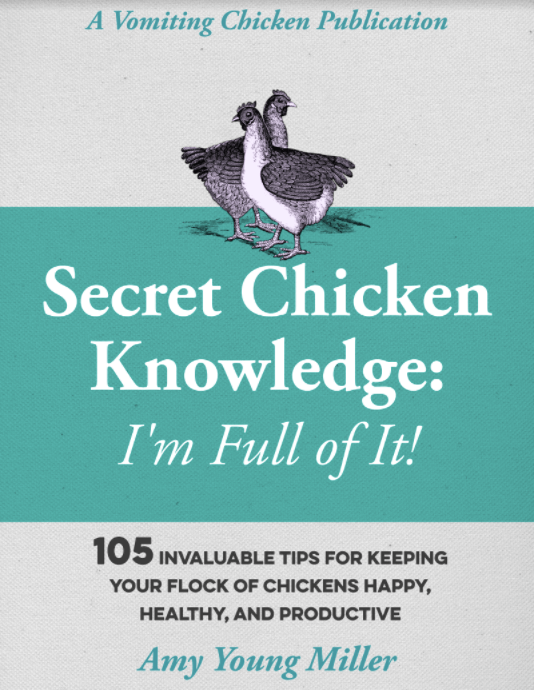 I dream of having my chickens run through it, getting out of the c-o-l-d of Texas (its down in the 30’s at night!!) and keeping my bugs at bay. You know, they could even dig up my root crops for me! Now that is efficiency for you. Have a wonderful new year and keep the great stories and pictures coming. I have found a new friend since I found your site. Thanks for sharing your life and family with us all. I’ve been wondering where you were. I didn’t imagine you sobbing, though. Thank goodness everyday family events kept you sane. And the play. Or maybe not, but I couldn’t imagine you yelling at the cast. Hold in there. I believe we should look for the small things that cheer us amongst the chaos. Thanks Francene. I’m hanging in there! You do the same, and I hope your new year is filled with blessings! Hey, Amy! 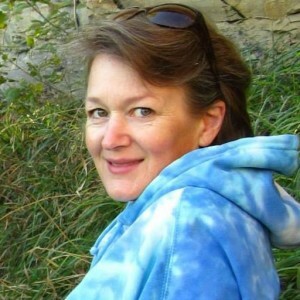 Glad to be the one that gets to comment on your blog from the Ultimate Blog Challenge. Whew! It feels so good to be back and what a year it will be! Keep God first in our lives and we’ll see what He does! I’m looking forward to His many blessings! Well, Aletha, it’s just wonderful to see you back! It has been awhile! Blessings to you and your family this New Year and good luck with the challenge! A great post to round off a year! Here’s to a happy healthy 2014, with lots of sniffing for good reasons! Happy New Year, Amy, and happy hunting to Little Mack. Your other commenters are so right – its the little things (and family) that keeps us sane – it’s also family that tries to make us insane sometimes. Smiling at your dreams and the ice skating pictures – enjoying your sunshine and your virtual beets. Looking forward to another year of reading your blog. You always write just the sweetest comments to me. Thank you, thank you, thank you. I hope you have a wonderful New Year! you are such a busy, creative, organized mom! THANK goodness for waterproof mascara! I’ll take BUSY and sometimes, yes, even CREATIVE (Desperation does spur on the creativity, does it not?) but ORGANIZED???? My jaw dropped at that, because if there’s one thing I am NOT, it’s organized. But it was super-sweet of you to say so, just the same. Happy New Year to you!! Great things for which to be thankful. And, great things to anticipate continuing and loving. Aww! I really loved reading over your 2013 summary!